Don’t worry friends and family, I’m not giving up! This is not the relinquishing of a positive mental attitude. But as the week progresses, I’ve found myself thinking more and more about why I’m really here. Is it to make the summit? Is that the only thing that would make this trip worthwhile? And the answer is of course not. For anyone who knows how “goal-oriented” I am, I bet you’re thinking “yeah, right. Of course she’d be disappointed if she didn’t make it.” And maybe, before I got here, I would have agreed with you. But being here changes you. Each moment I spend on the mountain, every additional step that I take, feels like a win. A big win. Every day is pushing my limits – physically, mentally and emotionally. And I’m still going. The truth is, I am physically the weakest team member here – every step seems to take me that just bit longer! But I’m still taking steps forward each time. And if Nims decides to turn me around on summit day, I know I will have put everything I’ve got into the attempt. So, to summit or not to summit? Honestly, it doesn’t matter, I’m going to keep moving forward either way. So – enough philosophising! – what have we been up to the past couple of days? We spent our first night on the mountain at camp one after a beautiful hike up. Thankfully Chris and I were able to share our own tent (since unfortunately we had to say goodbye to a team member owing to a knee injury) and we laid out our closed foam mats and thermarest for the first time. Since we’re camping on snow, the double mattress is a must! A tent-cooked meal of tuna spaghetti and it was off to bed when the sun went down – a sun baked tent is too hot but it’s amazing how quickly the temperature drops once it’s dark. The morning was too windy to start walking as planned, so we got to stay snug in our sleeping bags as Nims handed out thickly spread pate & cheese sandwiches (all about the high calorie food up here!) and hot tea. Whenever the wind gusted by, it was like being passed by a fast-moving train – scary but also a bit exhilarating! Eventually though, it did clear up enough for us to start up to Camp two – Nido de Condores. Although this isn’t that difficult a walk, I found it tough-going. Remember in a previous blog what I said about personal admin? Well for some reason I just hadn’t gotten anything right today. My socks kept slipping down inside my boots, making them rub uncomfortably. My buff felt suffocating, even though I knew it was protecting me from the sun. My backpack has broken shoulder straps – not a problem at sea level but up the mountain, I was struggling. But all that meant making it to the top felt awesome! And although I felt like the slowest walker in slowville, we made it in about 3 hours 15 mins (and the average time is 2-4 hours, so basically bang on). It was also a good reminder that on a more important day – like summit day – I have to be extra vigilant about how I prepare in the morning. After eating lunch, burying gear and spending about two hours at camp two, we then basically “slid” down the mountain to base camp as quickly as possible. It looks like the weather is clearing for the weekend, so now we’re ready for the push! But if I don’t make the summit guys, don’t be sad for me. I’ve already accomplished way more than I possibly thought I could. 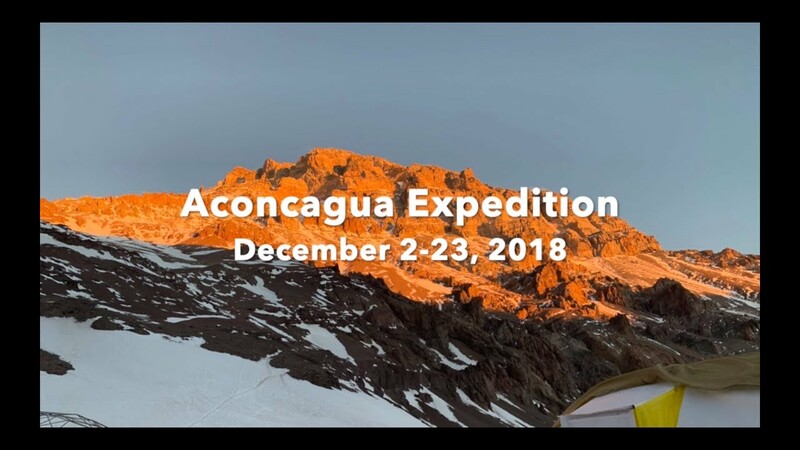 Oh Aconcagua, what are you doing to us?! We’ve now had three days at base camp – long drop toilets, no showers and temperatures of about -20C and below with the wind chill. Suddenly I’m grateful for all the layers and equipment (however expensive!) that we brought with us, including the 8000m boots (mine are the La Sportiva Olympus Mons), the Rab 1200 sleeping bag, and the aforementioned (in the previous blog post) summit suit. We’re all acclimatising well though, my oxygen saturation levels are in the mid 80s and heart rate is good. It’s all about “personal admin” up here, remembering to have gloves and sunglasses and a buff, being religious about sunscreen and drinking water (or rather, Tang! ), using hand sanitizer. Base camp rest days are spent reading, posting blogs, swapping stories with fellow team members and eating. We try not to sleep too much during the day because bodies don’t acclimatise as well during sleep. The nights are cold but full of stars… a small consolation for having to exit the warmth of a sleeping bag for multiple pee breaks in the night! Yesterday though, there was a nice break in the weather and we were able to take a trek up to Camp One. Now this is the kind of experience we had been waiting for! Bright blue skies, stunning vistas of the Andes. We have a professional photographer on the trip and he has been taking some truly epic photographs of us (his name is Leonardo Avezzano if you want to look him up on Instagram and online). In this photo above, I’m 2nd in line and Chris is 4th. As you can see, we were in our big boots and crampons right from the start. It’s not often that there’s snow on the route up to Camp One (more normal is rock and scree), but actually walking on the snow is quite easy and saves the soles of our boots. Nims focuses on a slow and steady pace on the way up, stopping to teach us crampon skills and how to breathe with a buff without fogging up your glasses. The sun is fiercely strong up here, and although it’s so hot that we strip down to base layers, it’s important to keep your face covered as much as possible. The rays reflect back off the snow, so full coverage sunglasses are a must too. Gear and admin! It takes us about 4 hours to reach camp one (with a long lunch stop), and it’s picture perfect up there. We stop for a couple of hours, setting up a tent and storing gear for the next time were able to get up there (fingers crossed). Thankfully getting down is much faster as we’re able to take a much more direct route down the slope. Honestly, this is what I was hoping for when coming to Aconcagua! The hike up was tough but stunning, and so worth it for the views. But the weather is not playing ball with us. The winds at base camp were so strong last night that they blew off the door of our tent!! Luckily we were able to “fix it” with some guy rope and gumption. The next week is not looking good either, with strong winds forecast. We have until the 18th to attempt the summit but that will be a lot of roughing it at base camp – not so fun! I much prefer the days we get to walk, to stretch our legs and see the views. But the mountain is the mountain. We’ll just have to wait and see if we’re permitted to climb any higher.